On November 2nd the Bank of England did something that it has only ever done before at the beginning of a World War. It doubled the Base Rate. The two previous occasions were 31st July 1914, three days after the start of World War One, and 24th August 1939, eight days before the start of World War Two. On those prior occasions the rate went from 4% to 8% and 2% to 4% respectively. This month it went from 0.25% to 0.5%. Which is one reason that it is different this time. The chart below puts this in some perspective. 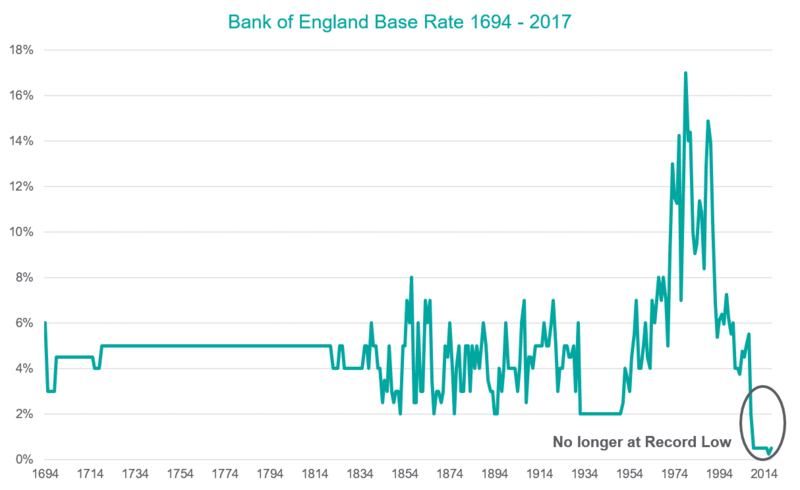 It shows the level of interest rates at the end of every year since the Bank’s creation in 1694. Recent years have seen remarkable stability in rates. After cutting the base rate to 0.5% in March 2009, it was left unchanged until August 2016, when it was cut to 0.25% after the European Union referendum. That period of over seven years was the longest period of rate stability since 1939-1951. Prior to that you have the rather splendid 103 years from 1719 until 1822 when the rate remained at 5%. While not promising that kind of stability, the commentary from Governor Mark Carney that accompanied the hike suggested that the path of future rate moves would take into account current market expectations which currently only suggest two more rate hikes in the next couple of years. The market therefore took this as only a very modest move rather than the beginning of a major tightening phase. We see it as the reversal of the cut following the referendum which now looks like an overreaction and based on a hopelessly wrong prediction by Carney that a Leave vote would cause a collapse in the UK economy. Carney remains cautious on the outlook with his emphasis on the risks and uncertainty surrounding the Brexit outcome. This gave the market the chance to take Sterling down (it fell 2 cents on the day versus the dollar) and to buy gilts. The FTSE Actuaries All Gilt index was up 0.7% on the day, the best day for gilt investors since June. Despite this, our macro view is unchanged. We still have synchronised global growth and leading indicators of economic activity are suggesting there is more strong growth to come. Although the UK economy is not growing as strongly as some, the combination of a weak Sterling and robust growth overseas will help the UK economy despite the Governor’s understandable nervousness about the impact of the Brexit process. Notwithstanding its immediate reaction to the rate hike, a big problem for the gilt market remains that UK inflation is higher than in the other of the world’s largest economies. UK CPI is 3% and RPI is 3.9%. It is not just the bank rate that is well below that level. 50-year gilts yield just 1.62%. This means that real yields are at multi decade lows. As we have written about recently, with interest rates so far below the level of inflation the real, inflation adjusted purchasing power of savings is declining. This all makes the gilt market unattractive in our view. For example, if the gilt index yield rises by 1% over the next 5 years your total return will be zero before taking inflation into account. Over the same period the 50yr gilt will lose 2.9% per annum if its yield rises from 1.62% to 2.62%. After taking inflation into account you will lose more like 5% per annum in the 50-year gilt under that scenario. As investors we continue to favour equities over gilts. And while not as pessimistic as Mr Carney, we are of the view that many overseas equity markets offer better opportunities than the UK. Hence the global focus at Waverton offers our clients timely diversification while we watch the resolution of the ongoing political and economic uncertainty unfold here.